Note: Creates the most unusual fruit salad or cocktail! Toast coriander and cardamom pods in a sauté pan, remove to a small bowl and crush pods with the back of a spoon. Add all of the ingredients, except for the rose water, back into the sauté pan and bring to a gentle boil. Reduce heat to a simmer for 1 minute. Take off the heat, squeeze the vanilla seeds into the water, and place into a blender for 2 minutes. Strain seeds. Allow to cool and add rose water to taste. *Options: Pour over grilled Pineapple and allow to marinate for a few hours. Serve with diced granny smith apples, pomegranate seeds and top with vanilla ice cream. Place quinoa in strainer and rinse under running water. Put quinoa and broth in saucepan and bring to a boil. Cover and reduce to a simmer. Cook for 10-15 minutes or until all liquid is absorbed. Spread out over a sheet pan to cool. Combine lemon zest, juice, garlic & pepper. Set aside. Combine vegetables in a bowl. Add in the feta and allow to sit together for 10 minutes. Stir in cooled quinoa,parsley and dressing. Serve at room temperature or chilled. Cook farro in vegetable broth until al dente. This will make 4 cups cooked. Prepare the mango, avocado, red pepper, scallions, cilantro, season with salt and set aside. Combine the fresh ginger, cilantro, curry powder, jalapeno, lime zest and juice, and tangerine zest and juice. Whisk together and set aside. Allow farro to cool to room temperature. Once it has cooled, combine with the vegetables and dressing. Allow to sit for 1-2 hours to come together before serving. 1. Cover cashews with boiling water and leave to soften for 15 minutes. 3. 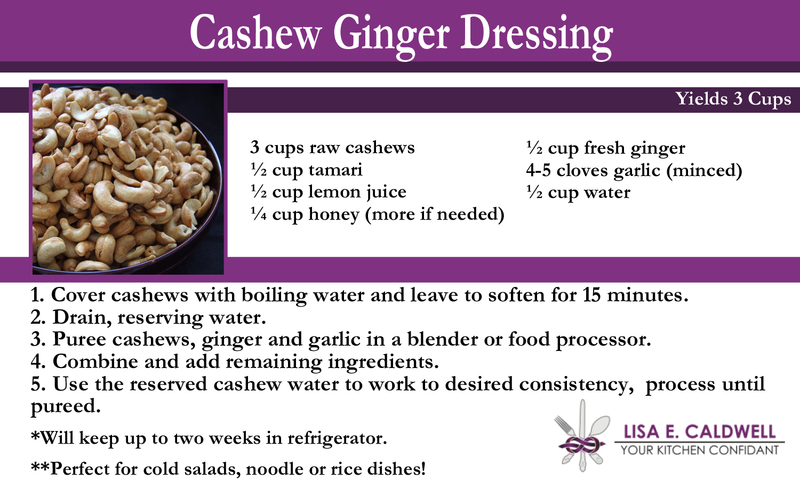 Puree cashews, ginger and garlic in a blender or food processor. 4. Combine and add remaining ingredients. 5. Use the reserved cashew water to work to desired consistency, process until pureed. *Will keep up to two weeks in refrigerator. **Perfect for cold salads, noodle or rice dishes! Poach shrimp in simmering water until pink, shock in an ice bath and remove shells. In a medium bowl, combine the mustard, vinegar, extra-virgin olive oil, tarragon and season to taste with salt and black pepper. 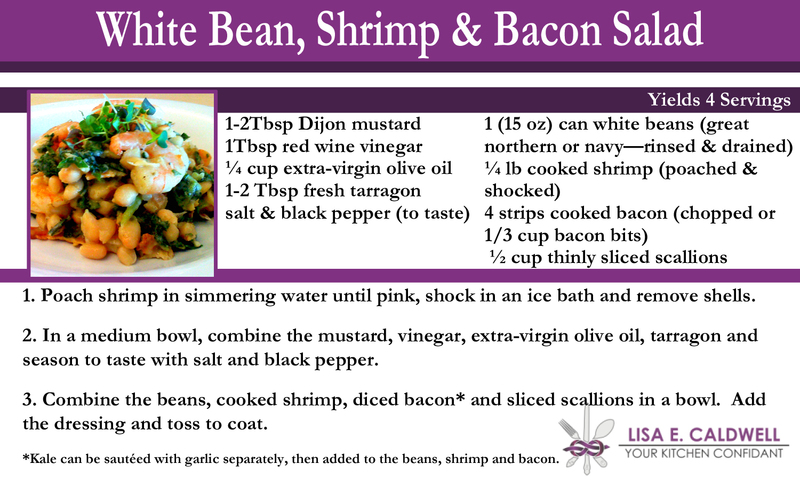 Combine the beans, cooked shrimp, diced bacon* and sliced scallions in a bowl. Add the dressing and toss to coat. *Kale can be sautéed with garlic separately, then added to the beans, shrimp and bacon. Peel the cucumbers, leaving a few strips of the skin on. Cut in half and then into quarters, slice. Peel and cut mangoes into pieces the same size of the cucumbers. Mix the two together in a bowl and season with salt. Chop the cilantro and mix in just before you plan on serving. In a medium bowl, combine dijon mustard, red wine vinegar, half of the extra virgin olive oil, tarragon, and black pepper. Place a sauté pan over medium heat and add the remaining vegetable stock and copped kale. Add the garlic and sauté until the kale is wilted. Add white beans, shrimp, kale and scallions to the dressing and toss to coat. Pan sear chicken in a skillet on both sides, 5 minutes each. Finish cooking the chicken at 350 degrees in the oven for 15-20 minutes of until internal temperature is 165 degrees. Remove from oven and cool. Shred chicken by pulling it apart once it has cooled or slice chicken into thin slices on the bias. Steam broccoli lightly and shock in an ice bath. In a large bowl add sliced chicken, broccoli, cabbage, carrots, spinach and scallions. Add dressing to bowl and fold in gently.